The lawsuit provides an opportunity for women who claim to have been harmed to have their day in court in a forum where the truth can be tried. He has no place in Disney. It’s not a place for a predator. 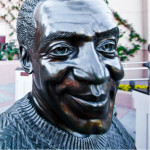 To see the bust of Bill Cosby as a hero on a pedestal in Disney after the family history, and we know of what had happened to my aunt all those years ago, it’s hurtful. The court recognizes that some jurisdictions do apply a version of the conditional self-defense privilege, which allows individuals, in certain circumstances, to publish defamatory responsive statements necessary to defend their reputation. However … such a privilege does not permit a defendant to knowingly publish false states. We’d expect and hope the judge rejected every one of Mr. Cosby’s attempts to throw the case out of court and allowed the case to proceed.